Oh my. 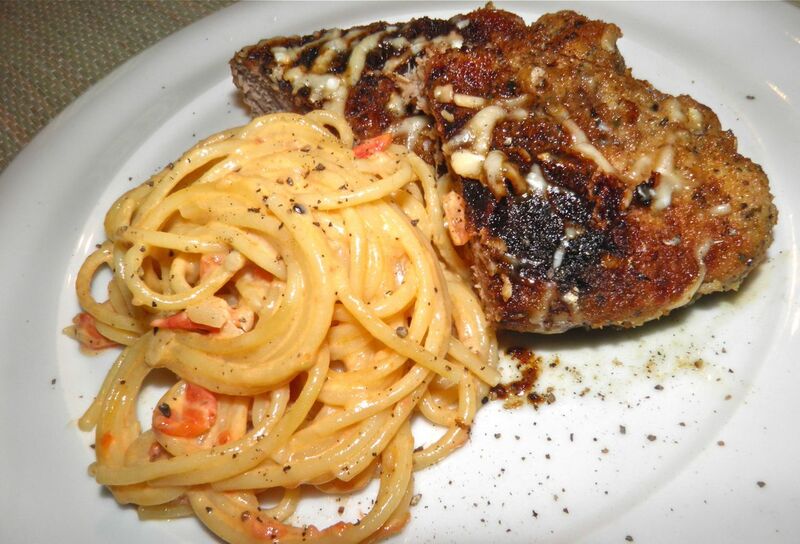 Those were the first words out of my mouth when I tasted the pasta's cream sauce I made for with these steaks. It doesn't happen all that often, so when it does... You know what I mean. The method is sort of a “chicken-fried” steak (if you’re from North America), but other regions of the world have this technique as well. Germany has schnitzel and Italy has scaloppini. But at nearly an inch thick these are far from both of those. I used to serve these steaks with pasta that was tossed in sliced garlic sautéed in lots of olive oil. This evening I decided to change it up a bit with the introduction of tomato and cream. Boy, did I make a right move. It’s funny, when I write to you I’m usually waxing poetic on the virtues of the main dish, but tonight it’s the side that’s the star. Now, I don’t want to slight the steaks. They are moist, tender, flavourful and easy to make. But when you’re faced with two delicious recipes – and one turned out WAY better than you expected – what do you do? I like to think I’m flexible (although others would disagree…). I have changed what I was going to write about. I had to. My mind was racing with what else I could do with this sauce. For just a few ingredients it certainly delivered. The vermouth added complex herb notes that would not have otherwise been there. In hindsight I should have used my homemade Vermouth No. 5, as opposed to the Noilly Pratt. If you’re interested, my recipe is here. 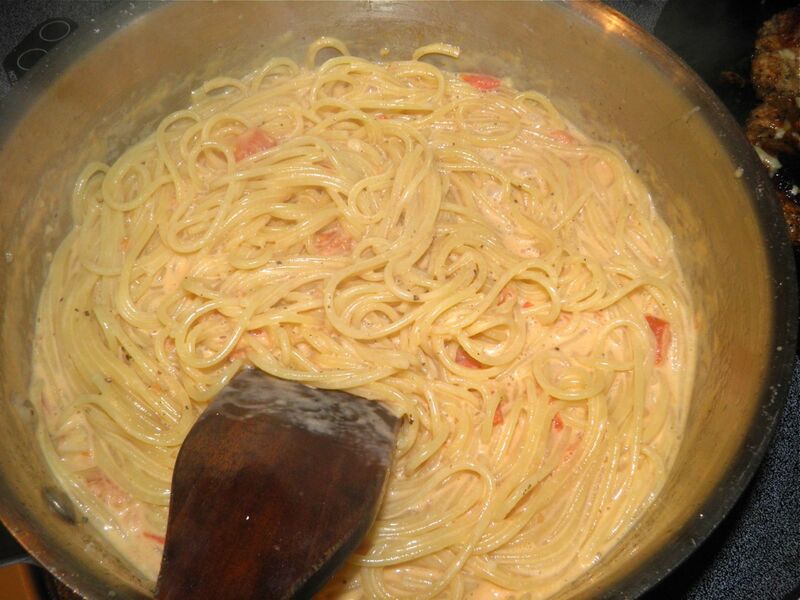 This sauce – certainly not for the dieter – clung to the pasta and suspended the chunks of tomato and garlic. It was a delight. And the smell that filled the kitchen was mouthwatering. How else would I use it? I think it would pair well with chicken, shrimp or scallops. Be warned, though, it is very “rich” so rich ingredients – for example, lobster – might be a bit much. Bring the sauce ingredients together and let simmer to reduce. Combine the bread crumbs, basil, oregano, garlic, onion, salt and pepper in a plastic bag. Shake to mix well. Mix the egg and cream together in a plate. Heat the olive oil in an oven proof frying pan. Dip each pork steak into the egg and coat well. Then place in the meat into the breading and shake to coat. Place in the hot oil. Repeat with the remaining steaks. Fry the steaks on each side until well browned. Sprinkle the steaks with the parmesan cheese. Then place the pan in the oven for between 15-20 minutes, or until the internal temperature of the steaks reaches 170°F. Any more and the meat will be dry. Cook the pasta in salted water while you make the sauce. Melt the butter in a wide saucepan. Chop the garlic and add to the butter. Sauté for about 1 minute. 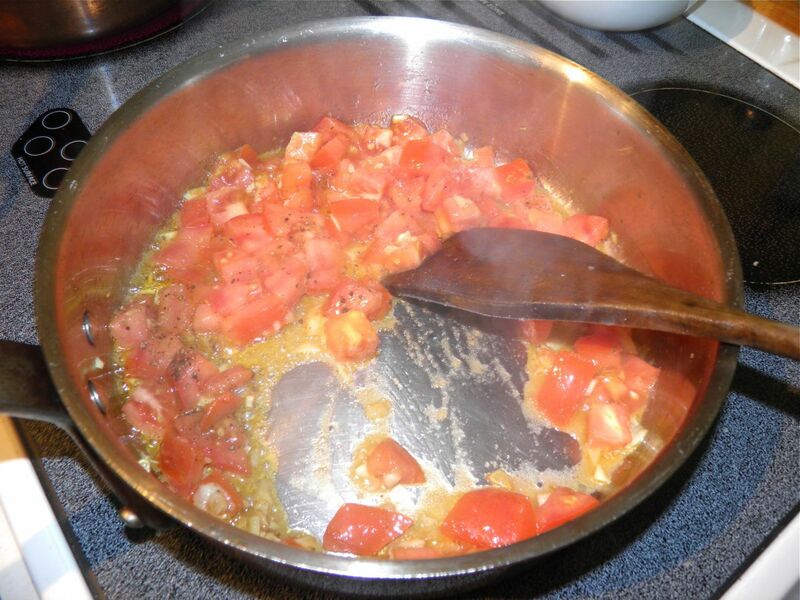 Chop the tomato into 1/2 dice and add to the pan. 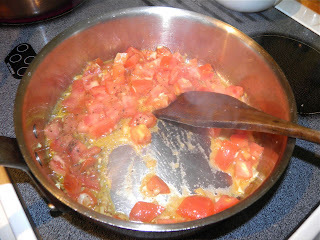 Sauté until the tomatoes begin to break down slightly, about 2 minutes. 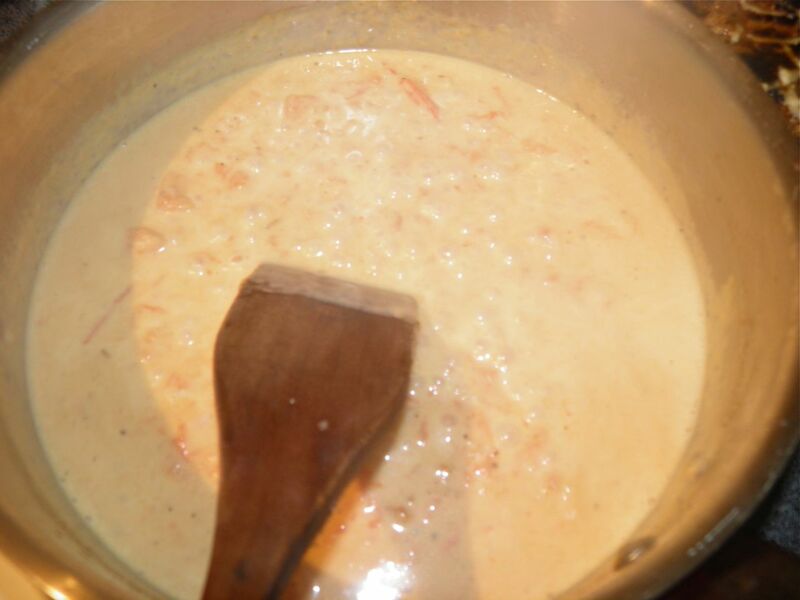 Add the cream, vermouth, 1/2 tsp salt and 1 tsp pepper and slowly simmer until the sauce becomes thick enough to stick to the pasta – about another 4-5 minutes. Taste for salt and pepper and adjust. Drain the pasta and add to the sauce in the pot. Mix well and serve.